Discover the joys of winter in the Kamloops Thompson region of British Columbia. 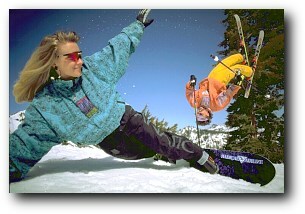 Join the throngs that are taking up one of the most popular winter activities - down hill skiing. Kamloops & Thompson region mountains offer great downhill and snowboarding snow. This BC region offers a number of excellent ski resorts with a good variety of slopes, accommodations and services including qualified ski and snowboard instructors, programs for children and beginners as well as night skiing. Come ski the Kamloops Thompson! The Kamloops Thompson region in winter is a wonderland of white mixed with shades of blue and green. The white is the blanket of snow that covers the higher altitudes; the blue is the sky that melts into the green tones of the forest. This combination makes for excellent BC cross country (Nordic) skiing. Throughout the region are numerous cross country trails that offer the skier hours of good clean winter fun under clear and sunny skies. Trails vary in difficulty . 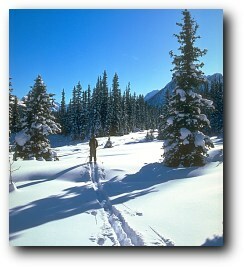 . . from marked and groomed trails to wilderness backcountry. Many ski resorts and ski lodges are open all year catering to the winter enthusiast, as more and more people enjoy winter activities in British Columbia's Kamloops Thompson region.